This simple, delicious cake is perfect for breakfast, a tea party or a midnight snack. I highly recommend the latter. Worked perfectly for me tonight. All but the one piece I ate is going into work with my hubby tomorrow. It’s delicious with fresh or frozen blueberries and comes together in a snap! This batter is nice and thick, so your blueberries won’t sink to the bottom. No need to toss with flour, sugar or anything else as some recipes require. No fuss, just right. Heat the oven to 375° and generously grease a 9-inch square or round pan. Combine the flour, baking powder and salt in a small bowl and stir to combine. In a medium bowl, combine the butter and sugar and beat with a mixer at high speed until well combined. Add the egg and beat well for 1-2 minutes, stopping to scrape down the bowl, until the mixture is smooth and light. Stir in half the flour mixture, and then half the milk, mixing just enough to keep the batter fairly smooth and well combined. Add the remaining flour, and then the milk & the vanilla, mixing gently. Stir in the blueberries. Scrape the batter into the prepared pan and bake for 35 minutes or until the cake is golden, springs back when touched gently in the center and is pulling away from the sides of the pan. Fabulous – I could go a piece of that with a cup of tea! Mandy. Do you take your tea with milk and sugar? Or just black? I’m of British stock, and like mine the way my Nanny always made it. One sugar and a spot of cream. Wow, I wish I got up early enough to make these for breakfast. Was the cake done in only 35 min? yes. actually my cake was done in 30 mins. also, at first i was a little concerned that the batter was too thick and that the cake wouldn’t turn out well but this cake is awesome! loved it. definitely a keeper. thanks! Just tried this recipe – very tasty! Like Sofia I was concerned about how the cake would turn out because the batter was so thick – the finished product is actually light, not heavy at all. Great for breakfast or a snack. Thanks! My granddaughter & I made this this afternoon. Simple & delicious! I doubled the recipe to fit in a 9×13. My mom had a recipe like this one growing up that used a lot of shortening instead of butter. I’m glad that I’ve found it. This is nearly identical to that recipe in taste and texture. We also finished with a good sprinkle of sugar on top before baking. I cannot tell you how many memories this recipe has brought back for me. Thanks! 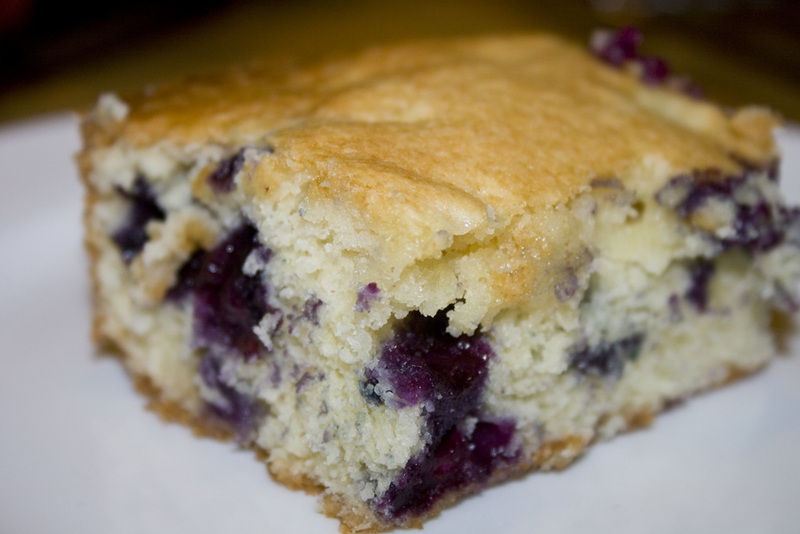 Thanks for finally talking about >Blueberry Cake | Bakerlady <Liked it! I found this simple recipe via a google search and have been making it for quite a while now. I like the simplicity, density, and pound-cakish-ness of it, reminds me of my childhood in Germany 🙂 So yesterday i was once again whipping up the batter (doubled it like reader Sean) just to find that my blueberries had expired into some very sad unusable fruit. I decided to quarter/ peel /core/ cut into small chunks a few apples and mix into the batter. Glad I did – we all liked it a lot and I will make it again, next time i will add a simple glaze of powdered sugar, lemon juice and water like I normally do with my much more involved go-to Apple Bundt Cake Ready to try with other fruit…………cherries? ?